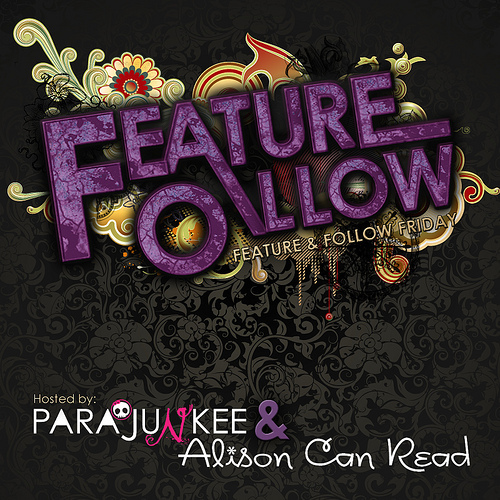 Feature and Follow Friday is hosted by Parajunkee and Allison Can Read. The #FF is 150 weeks old! And we want to hear from you! What would you change about the hop? What do you like about it? Or just suggest a question to be used for next week! Hmmmmm, well I haven't been participating that long so I really can't think of anything to change! Congrats to Parajunkee and Allison Can Read for their success!! If you want to follow me, anyway is fine, but I would rather you DON'T USE GFC. Interesting question! I'd have to think about that one! I think that's a great question!! And I also had that problem of blogger and me not getting along. It made one of my post blue and highlighted green, and no matter what I did it wouldn't go away. Yikes, that post must have looked kind of awkward. i tried changing my HTML codes, but noooo, Blogger still hates me! LOL!! Thanks for dropping by! Anyway, I followed you via Bloglovin too!! Can you please follow back? Thanks!! Sorry, I didn't mean that you couldn't follow via GFC, I just heard it was going to close down and it kind of freaked me out! Thanks for visiting! I would love to have Julia Quinn write another fabulous book in her usual style, but with me as the heroine! Ha!!! That would be great!!! Thanks for stopping by! I love your question, I sure hope it gets picked :) Following you back. Thanks!! Glad you dropped by! New Follower hopping thru from (Parajunkee & Alison Can Read) "Feature & Follow"
"Bound By Love Book Reviews"
Hello! New to the hop, and super excited to get involved! I followed, can you do the same? Thanks! Thanks for stopping by!! Love your blog!